One mile from town, take right fork, prior to the gas station with a Cecil Federal Bank sign, onto Hances Point Road. About one mile from fork at Weaver's Plum Creek Market, bear right keeping Weaver's Plum Creek to your left. About 7/10 of a mile turn right onto Wingate Rd. There is no road sign for Sunset Drive. 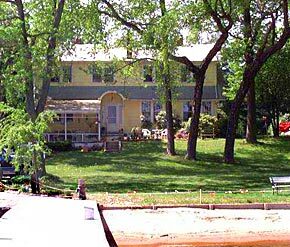 North Bay Bed and Breakfast is the yellow house to the left at the water next to Bay Boat Works' blue office building.